"Equilibrium" is a cross between "Fahrenheit 451" and "The Matrix." Man's quest for utopia turns out to have flaws that go against the grain of our collective spirit. The story has been told before, and better, but the movie does provide cinematic thrills. In "Equilibrium," war has been eliminated through medication. It's as if the world was a classroom full of hyperactive kids. Rather than use creative learning to channel their energies, Big Brother, or in this case, Father gives everyone a regular does of Ritalin (actually Prozium) to calm their asses down and keep everything in line. In order to enhance the effects of the drugs, anything which appeals to the human spirit such as literature, art or movies is strictly forbidden. The penalty for such "sense offenses" is death by incineration. Enforcing the will of Father is a group of men called Clerics. Clerics are samurai automatons who can dodge bullets and kill men, women and children without mercy. 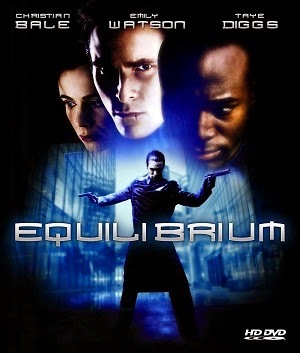 "Equilibrium" is the story of a Cleric (Christian Bale) who gets off his meds and hooks up with the underground. You can figure out the rest. I liked this movie a lot more before I sat down to actually write the review. As I write, I find cynicism seeping in that I didn't realize I felt. Visually, "Equilibrium" is imaginative and impressive. The action sequences are quite good. The problem I have with this movie is that its preaching is so obvious. Also, like I said before, the story has been told before, and better. Predictable story with stunning visuals and action. Great sound and picture. OK extras. Excellent transfer. Except for some slight shimmering, a flawless picture. Great delineation of colors. No artifacts or pixilation. Good flesh tones. Outstanding sound. The audio track will make your home theater system sweat. The first scene in which Bale's Cleric takes out a room full of machine-gun wielding free thinkers will make you jump out of your chair. Bullets seem to fly all over the place. Nice balance between the ranges and excellent integration of the sub-woofer with the other speakers. The featurette "Finding Equilibrium" is your typical five-minute promotional film. It is full of interviews with the cast and crew telling you why they had to do this movie. Yawn. For some reason, the DVD has two commentary tracks that could have just as easily been combined into one. Director Kurt Wimmer speaks on both tracks: one by himself and the other with producer Lucas Foster. Mr. Wimmer has passion for his film. It shows in the commentary track. However, the extra track could have been incorporated into the first. The DVD also includes sneak peeks for Tarantino's next film "Kill Bill." Can't wait to see that one. There are previews for a couple of other movies also. Ho-hum. Younger viewers, unfamiliar with "Fahrenheit 451" or "1984" might find the film's sermon new and refreshing. For the more experienced or jaded viewer, the movie's visuals and action sequences will be enough to keep them happy.